We had so much fun in Miami I almost didn’t want to come back home! Last weekend Andrew told me he wanted to go to Miami for a spontaneous getaway trip – spontaneous as in “let’s go tomorrow.” I’m normally one who prefers more advance notice but all he had to do was mention The Salty Donut and I did not hesitate to immediately start throwing things into a suitcase. I don’t think I’ve ever packed so fast in my life! If you haven’t tried The Salty Donut in Miami add it yo your list. They have the best donuts I’ve ever had and if I lived in Miami I think eating there would be a weekly habit. Since moving to Florida so many of you have asked me about packing tips for your vacations. You want to know what to wear, how hot it gets, what sunscreen wears the best, etc. I’ve also received so many questions about the Away Luggage and other accessories like their packing cubes, everywhere bag and backpacks. I’ve put together a travel diary to share exactly what I packed, what I wore and thoughts about everything we’ve tried from Away. This trip we stayed at the Loews Miami in South Beach. We’ve stayed in a few different areas in Miami before and we really love staying by the beach areas. Other neighborhoods also have their benefits but being in South Beach is so fun. You can literally just stay at a hotel in the area and have everything you need for a fun vacation without a car. We like to get around and since we live in Florida we drove 4 hours from Tampa to Miami. We had a pleasant stay at the Loews! Staff is really attentive, rooms were clean, pool and beach area were really nice. The food and coffee bar were spendy but that is expected in South Beach. We tried breakfast at their Preston’s Market which was pretty good – we ate outside on the covered patio which was really beautiful and relaxing. This is our fourth trip to Miami and each time we plan a mini vacation. We leave feeling like we should have stayed longer! We’ve already found some favorite eats but force ourselves to try something new each time. That being said, my ride or die must-eats for every trip are The Salty Donut and Panther Coffee in Wynwood. We bought a box of four Salty Donuts and walked over to Panther Coffee down the street for a perfect snack. 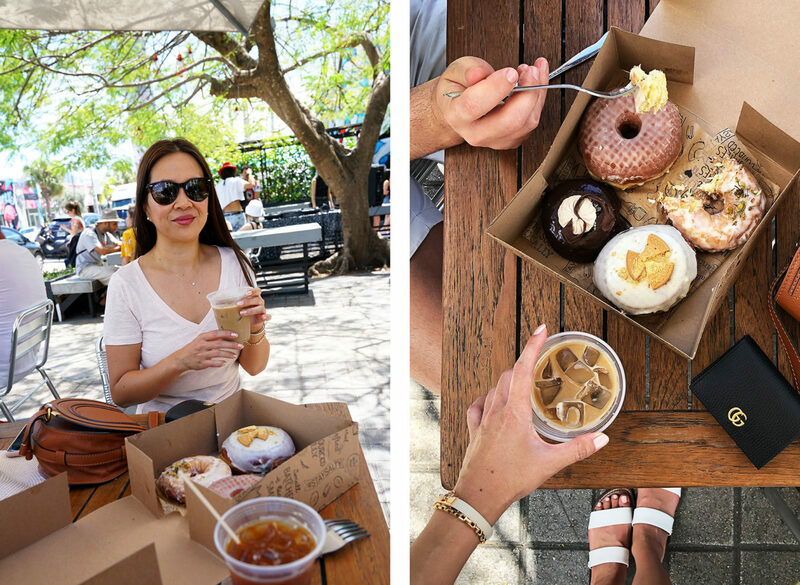 This round we tried the Guava and Cheese, Coconut Lychee, Chocolate Marshmallow and Traditional Glazed Donuts. They’re AMAZING! For shopping we stopped by the Glossier Miami Pop Up which was a few blocks away, also in Wynwood until April 28th. Full recap plus haul in this post. If you’re in town definitely visit – it’s super cute! During our trip we did a tiny little bit of shopping. We did a quick stop in the Miami Design District to walk around, window shop and browse. I splurged on a pair of Celine Round Sunglasses which I’m really excited about! There’s also a tiny Aesop Store and Andrew bought a few skincare items to try including the Control Anti Blemish Gel and another bottle of Mouthwash. I had my eye on the Sao Paulo Kit for travel but decided to think about it. There’s a really cute Taco Truck inside the Miami Design District called La Pollita which has cute snacks and drinks. We were stuffed from food earlier in the day otherwise would have tried the tacos, we took a few sneaky peeks at what other people were eating and it looked and smelled delicious. Since we stayed in South Beach we spent the rest of our time near the beach areas. This time of year it’s warm but not too humid and the water temperature is so nice to swim in! We love the blue shallow water, it’s one of the nicest places to swim. We rented lounge chairs and an umbrella at the beach. You can also rent them even if you’re not a hotel guest. Policy might be different depending on hotel, but we’ve also found in Tampa a lot of the hotels will rent their beach chairs and cabanas to anyone. A few more new eats we tried this time included Yardbirds on Leonox Ave and Havana 1957 on Espanola Way. We enjoyed both immensely! If you’re new to the Miami South Beach area, quick note that some restaurants automatically include tip in the bill labeled “Service Charge.” We didn’t realize this at one of the places we ate until after we left and looked at the bill and realized we ended up leaving a seriously hefty tip because we tipped on top of the tip. A few people had mentioned this to me before but I had forgotten about it! I feel like I still have yet to really explore Miami enough to find the best eats. I’d love to explore more of Wynwood though. Bigger Carry-On is our favorite to fly with and travel with in general. Works on flights we’ve flown with Delta, United, American Airlines. It’s roomier than the Carry-On but still fits in the overhead compartments for the listed airlines. Medium Suitcase makes more sense for us for longer distance trips. We brought this with us on our California trip over the holiday and think it’s much more convenient to have something larger vs. carry ons for our needs. I plan on buying a second one soon. Everywhere Bag is the best travel bag I’ve ever tried. I normally use my totes and end up stuffing them full. These bags have well thought out storage zippers and pockets as well as a roomy interior. It fits perfectly under the airplane seat in front of you but is roomy enough to carry a laptop and other essentials you might need for on the plane. There is an exterior pocket to store documents for easy access before you get on the plane. It also has a pocket to attach onto your suitcase handle. Packing Cubes have gone through a couple design changes, the current ones with mesh top are a lifesaver to organize your clothes, underwear, shoes etc and keep them in place. I bought a set for Andrew and he didn’t want to use them. I begged him to try and he’s now convinced it’s one of the best things invented. He can organize all his clothes by type and he loves how they truly keep things in place without shifting. Backpack is the larger option of the two they carry, this one has three main compartments to store things that allow you to be truly hands free. We love that it’s cushioned and that the base is flat so it can actually stand up on it’s own if you set it down. There are a couple nicely hidden compartment zippered pockets for things like your passport etc. It fits a lot more than we anticipated! A closer look at the Backpack which now has a personalization option! There are some more of their soft goods you can personalize with 3 letters which I think is so fun. I have my initials on the backpack. We brought it with us to the beach both back home in Tampa and in Miami. It has really well thought out pocket placement so there’s a place for everything. This one can fit a laptop inside as well. My full pack list linked below, makeup and beauty to follow in a separate post! We each packed a Bigger Carry-On, an Everywhere Bag and shared the Backpack space. Our trip was open ended – we didn’t know how long we’d be away when we left Tampa. You always love reading my thoughts on what I brought and what I missed so I’m doing it again! For a very casual laid back last minute getaway I had everything I needed. I still need to find a good beach coverup and an updated beach tote (although our backpack works better than any beach tote I’ve used). I didn’t pack a nice dress for a just-in-case occasion. Some of the restaurants are dressier and require something other than shorts. This round we were ok with everything very casual. I packed a denim jacket and some long denim pants just in case but didn’t end up wearing them. The three pairs of sandals I brought worked perfectly! I probably could have gotten away with just 1 pair of sandals but I like having options for a few days. If you’re going to be in Florida know the weather can be unpredictable. Bring a few extra sets of clothes packed with you just in case you need to change if you get rained on or sweat too much. When we’re going out to the beach even in Tampa Andrew always reminds me to bring an extra set of clothes to change into. I feel like it’s a bit of a hassle but I’m always really happy when I do have that extra dry clean set to change into. Aside from the obvious good sunscreen and sunglasses, a good hat is a MUST. I really am so impressed with the Eric Javits one I bought – it is large enough to cover the face and has the perfect amount of flop/stiffness with the brim. I’m going to buy one in black too. Hope you enjoyed this packing post and mini travel diary! We’ve been in Florida for a little over two years now and there’s still so much more to explore. I still want to go to Palm Beach and perhaps Key West again. If you’ve been to Florida what are your favorite areas?